Take action to save, protect, and improve the lives of animals while enhancing the human-animal bond. The SPCA of Anne Arundel County solely relies on the generosity of the community for the funding necessary to care for thousands of animals throughout the year. With your help, we are saving the lives of those who need us the most. Without compassionate individuals like you, this life-saving program wouldn’t be possible. I absolutely love volunteering here. The staff members are so nice and helpful whenever you need it. The other volunteers are the same. Great group of people to work with!! Oh and I love watching the dogs and cats go to their forever home!! Provides food, toys, and vaccinations for one animal for one week. 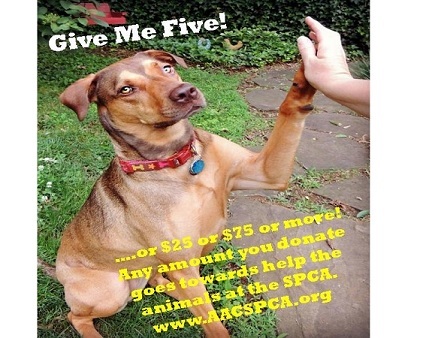 Donate 100% - Add 3% so that 100% of the donation goes to SPCA of Anne Arundel County. SPCA of Anne Arundel County has partnered with Network for Good to securely process your online credit card payment via Network for Good (tax ID 68-0480736). This transaction will appear on your credit card statement as "Network for Good." This transaction is subject to Network for Good’s Privacy, Security & Disclosure Statement and the Charitable Solicitation Disclosure.